Davids is the first openly gay Kansan elected to Congress, and she, along with Debra Haaland, (D-New Mexico), also elected Nov. 6, are the first two Native American women elected to Congress. 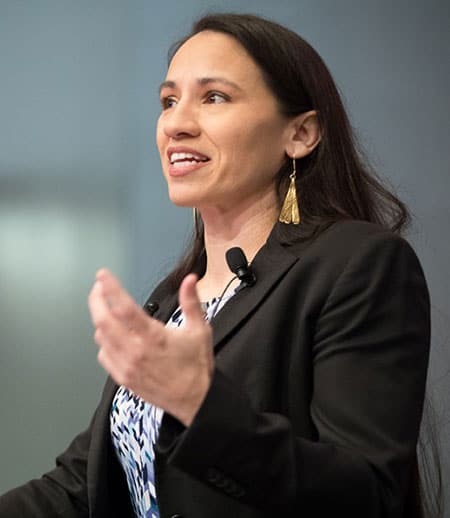 After completing her degree at Cornell Law School, Davids, a member of the Ho-Chunk Nation, worked as a White House fellow during the final year of President Barack Obama’s administration. Katherine Clark, J.D. ’89, Democrat, was re-elected to a fourth term in Massachusetts’ 5th District. In Cornell’s own district, New York state’s 23rd, Tracy Mitrano, J.D. ’95, Democrat, lost to incumbent Tom Reed, Republican. Susan Boser, Ph.D. ’01, Democrat, in Pennsylvania’s 15th District; Rick Green ’92, Republican, in Massachusetts’ 5th District; Jamie McLeod-Skinner, MRP ’95, Democrat, in Oregon’s 2nd District; and Rich Pezzullo ’80, Republican, in a bid for New Jersey’s 6th District. Political newcomer Zellnor Myrie, J.D. ’16, Democrat, was elected to the New York State Senate representing the state’s 20th district, which includes several neighborhoods in his native Brooklyn. Myrie won the Democratic primary in an upset over an incumbent and prevailed in the general election over the same incumbent, who ran as an independent. Andy Goodell, J.D. ’81, Republican, was re-elected to the New York State Assembly’s 150th District. Bob Stefanowski, MBA ’92, Republican, conceded a close race for governor of Connecticut. This article also appeared in Ezra.